Whole-experience program focuses on human connections — and having fun. Eight students, dressed all in black with colorful scarves line up in the front of the multipurpose room at the Student Community Center. Half of them look up to the projector screen waiting for the music to start and the other half look out to the room, surveying their peers who are sprawled across the room’s tables. They are preparing to perform a traditional Levantine Dabke foot dance for the Arabic End of Quarter Event. This is one of many performances in a night of songs, dances, poetry, skits and food that caps off another quarter of learning and gives the students an opportunity to show off their new knowledge of Arabic language and culture. The line leader looks at his group and nods and the dance begins. The students smile, lock hands and begin a carefully synchronized foot dance to traditional music as their peers in the audience clap along. 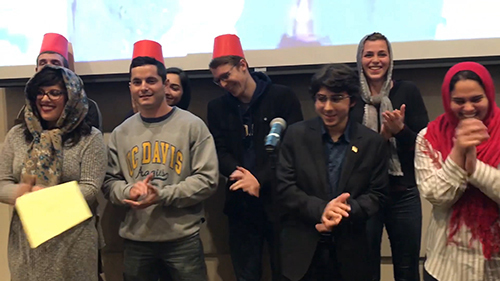 For the Arabic program at UC Davis, learning a language should be as enjoyable as it is rigorous, and it should always be rooted in the cultures of the people who speak it. “We really want to make the experience of learning Arabic fun, and we want our students to learn in a positive environment,” said Shayma Hassouna, the lead instructor for the beginning and intermediate levels. “We really need it now because [Arabs] are constantly bombarded by negative media and we see a lot of stereotypes. Each language represents a certain culture, so part of learning Arabic is breaking up these stereotypes,” said Ahmed Muhamed, another one of the instructors. The End of Quarter Event is the culmination of the opportunities in each course for students to get in touch with Arabic culture and language. Arabic songs are movies are played regularly to show the students the language they’re learning in a cultural context. Students learn two forms of Arabic—the Modern Standard written language and the Levantine spoken dialect, native to Syria, Palestine, Lebanon and Jordan. The team uses what they call the “communicative integrated approach,” which means teaching the language so students can use it colloquially to communicate everyday needs, such as comforting someone who is sick. To help with this, native Arabic speakers in each class are assigned a coaching role designed to help new learners, rather than intimidate them. They serve as a reference for pronunciation with a proper accent, a resource for questions and someone to practice conversation with. This creates a tight-knit community. Hassouna often finds her students creating study groups in class and becoming close friends outside of class. The relationships extend to the lecturers as well. Hassouna, Muhamed, and their colleague Manar Al-Shatarat feel familial pride when they see their students learning and enjoying the language they’ve been teaching them. Hassouna, Muhamed, and Al-Shatarat teach beginning and intermediate Arabic (ARB 1-3, ARB 21-3), which is housed in the Classics program. They offer an accelerated summer program for those who want to get their first year of Arabic out of the way in 12 weeks. Students who begin Arabic 1 with no any knowledge of the language or alphabet can write paragraphs by the end of the first quarter. By the end of two years, students can have sophisticated conversations with native speakers and read and interpret Arabic texts. Students who want to move on to advanced Arabic can also take a third year (ARB 121-3), taught by Professors Noha Radwan and Jocelyn Sharlet in the Comparative Literature department. In addition to language classes, Hassouna and Al-Shatarat co-teach the Arabic Culture Ensemble. 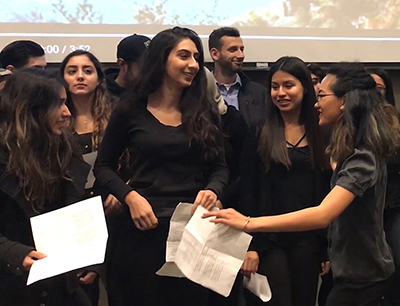 The group meets once a week and learns Arabic songs and performs in traditional uniforms “wherever Arabic needs representation” on campus and in the community. The ensemble is listed as a freshman seminar, but anyone who is interested in Arabic culture is welcome to join regardless of whether they are able to read or speak the language. Arabic at UC Davis began in fall 2006 after the Middle East/South Asia program received a U.S. Department of Education grant. It has been a cornerstone of the ME/SA program ever since. Shayma Hassouna has been with the Arabic program since the middle of its first quarter and remains the lead instructor for the beginning and intermediate sections. The program originally had just 40 students and two beginning sections. By fall 2007, the classes had long waiting lists and intermediate sections were added. After two years of steady growth and an excellent performance review, the program was expanded to include more sections and an advanced level. Manar Al-Shatarat joined the team in 2010. She started as a Fulbright Language Teaching Assistant from Jordan for a year and kept in touch with the program until she was hired as a full-time instructor in 2014. Al-Shatarat, fresh out of graduate school, revolutionized the program, playing a major role in developing and organizing the End of Quarter events and bringing modern teaching methodologies, enthusiasm, and a great work ethic with her. She remains an integral part of the program. Ahmed Muhamed was hired as the third member of the team in 2017. Over 200 students are currently enrolled in beginning and intermediate Arabic. Though a majority are Middle East/South Asia Studies, International Relations, or political science majors, students from all over campus have enrolled in the program because they want to work in the Middle East, or simply because they’re interested in Arabic language and culture. The Arabic program officially launched a minor in fall 2017, something the team has been seeking for some time. It rewards students who make it through three years of Arabic with something official that they can put on their resumes to document to the world that they’re advanced learners. The program’s alumni have gone on to use the language working in the Middle East in fields as diverse as law, medicine, agriculture, and social work. In the U.S., they’ve worked as translators for the State Department and at Shriner’s Children’s Hospital in Sacramento, helping Libyan children bombed by Col. Muammar Qaddafi get the treatment they need. When President Donald Trump’s travel ban first went into effect, former students were at the airports translating for refugees who needed legal help. “No matter what your political stance is, if your students are movers and shakers, you’re very proud of them,” said Hassouna. As the Arabic language program continues to develop, Hassouna, Al-Shatarat and Muhamed hope to continue seeing their students learn, grow, and make a difference in the world.